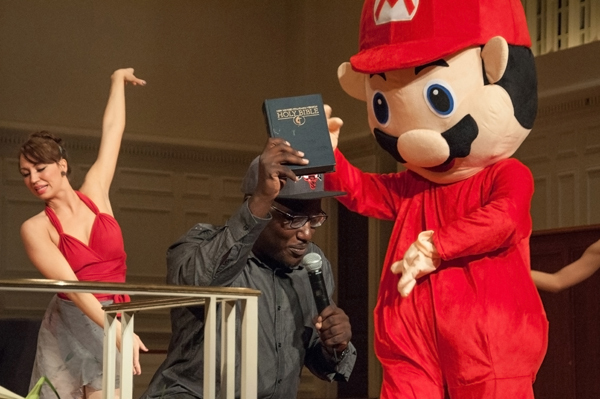 Comedy Central’s 2012 Best Club Comic Hannibal Buress rocked a packed Glenn Memorial Auditorium with his stand-up comedy act last night as part of this year’s Dooley’s Week lineup. Buress poked fun at a range of subjects from fraternity hazing to Jesus to the cost of an Emory education to technology. Prior to Buress’ act, local Atlanta comedian Chris Jones warmed up the crowd with a few jokes. Following Jones’ act, Buress began the show by hyping up the crowd and running around Glenn Memorial Auditorium, standing on the church benches, high-fiving students and pushing his face into photographers’ cameras. Buress began his act by complaining about the venue. Buress made jokes about fraternity hazing and historically African-American university band hazing. Buress also commented on dependence on technology. “There have been times I’ve been out, and my phone battery is at nine percent, and I was like, ‘Time to go home,'” Buress joked. Many students said they enjoyed the act and thought Hannibal was entertaining. Students on the Student Programming Council were glad about Buress’ performance and explained that they believe his act was hilarious. Some students who were previous fans of Buress’ thought his act last night was fresh and an improvement from his previous acts. Teich agreed with Belles that Buress’ new material really brought a new side of the comedian into the fold. Come on guys, Hannibal and the Eric Andre show are on the Atlanta based Adult Swim.